This is going to be a short post. I am stopping in to play with Freshly Made Sketches. There's still a little time to play if you want to stop over and take a look at all the beautiful creations everyone has made. Thanks for stopping in. Please come back again soon. I hope everyone had a nice weekend and ready for the week to begin! I have a card I want to share with you. I am playing along with My Favorite Thing sketch for the week. There is more time to play or just stop over and see all the creative cards that has been created from the sketch. Below is my take on the sketch. I used the "Trim the Branches Snowman" made by MFT, I think this little guy is so cute. I "Wink of Stella" brushes, these brushes are so nice, they have a glitter look to them when you color in your project. Check them out if you have a chance to purchase some. Thanks for stopping by. If you like my card, please leave a comment, I love to read them. If you like my blog, please follow me, the button is on the left side of my blog. Have a wonderful week and please come back, I hope to have something else for you this week. I hope you all are having or had a wonderful week. Today is my Friday, and I am so happy! Whew, who is cold tonight? I have not put on my heat, but it sure is chilly! I think winter is coming, get those coats out! I am playing along this week with the Mojo Monday sketch. Mojo Monday is my very first sketch that I have ever done. I love to do Verve's Mojo Monday's. If you have not purchased any of her stamps, you should go over to Verve shop and starting shopping. Verve stamps are clear stamps and they have very nice dies, that cut so lovely! There is nothing like a nice stamp that stamps nicely on the first try! With all that said, I did not use a Verve stamp, but I did use one of her dies. I bought this Halloween stamp last year and just had to use it. How do you think I did on my copics! I have been practicing a little. The little girls, face, arms and the orange on her hat I used copic. Thanks for stopping by, if you like my card, please leave a comment. I love to read them! 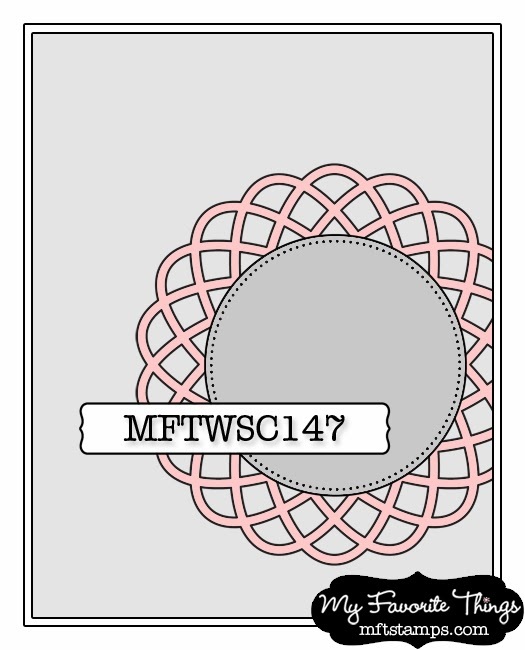 I am playing along with the Wednesday Stamp Club Sketch Challenge with MFT. 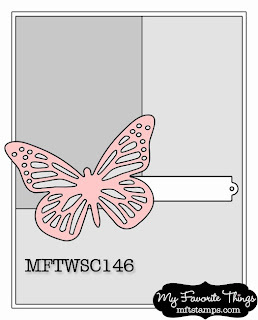 I love butterflies, so when I saw the sketch, I just had to play along. There's still time to play along if you want to do the sketch. Thanks for stopping by. If you like my card, please leave a comment, I love reading them. Have a wonderful week and please come back! 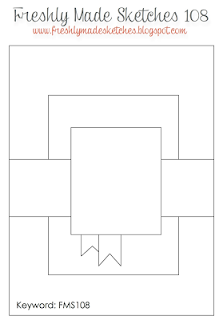 This is the sketch that I created my card from. 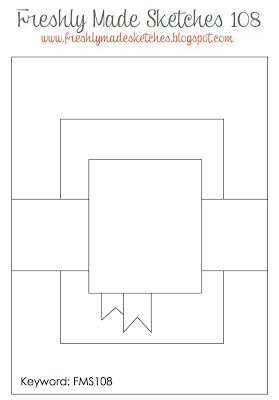 I am playing along with the Freshly Made Sketches and Simon Says Wednesday Challenge today. I love Freshly Made sketches and when I have time and remember, I like to pop in and join them. The design team for Freshly Made Sketches, they are all so talented. There is still time to play along if you want to join in on the fun! There is also time to play along with Simon Says, their challenge is Christmas/Holiday theme. I love my little mouse. I tried something different, I used Prismacolor color pencils. I saw a tutorial on using colored pencils and gamsol on Splitcoast. It was fun and I hope to do some more coloring with my pencils. How do you think I did? Thanks for stopping by, please leave a comment if you like my card, I love reading them. I'll be back again soon. I hope all of you had a wonderful weekend. Isn't it funny how the weekends fly by and the weeks seem to drag on and on. I am sharing a male card with you today. I made this card in June as a Father's Day card, so I recreated it and made it a birthday card. 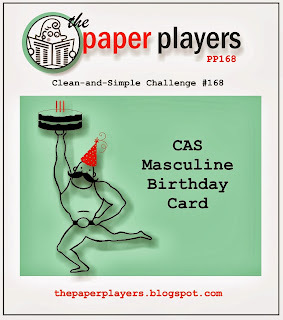 I am happy to be playing along with Paper Players masculine birthday card challenge again this week. I think this card is a perfect card for a male's birthday! 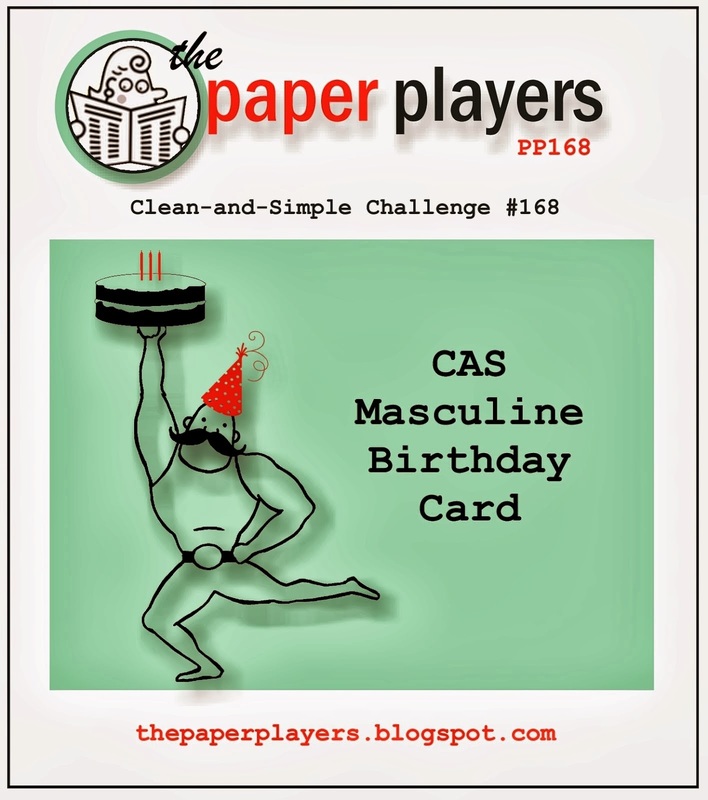 I want to thank LeAnne from the Paper Player's design team for choosing my card from their color challenge last week. I loved the colors you all chose last week. I would have never put midnight muse and pool party together. I took my card to a crop on Saturday and everyone loved the colors and the card. Thanks again for stopping by to check out my cards. I love creating and sharing my creations with everyone! If you enjoy my card, please leave a comment, I love reading them. If you love coming back to my blog, please follow me, the link is on the right hand side. Have a wonderful weekend, I will see you again soon! I am playing along with the "Try Stampin' on Tuesday" sketch. They are out of Canada and are celebrating Thanksgiving. I enjoyed all the cards the team created. My card is a note to wish them a Happy Thanksgiving! I hope you enjoy my card, please leave me a comment, I love to read them. If you like my blog and wish to keep coming back, please join me on the left hand side. Thanks Try Stampin' for a great, but simple sketch. I hope to return to join you on some other sketches. 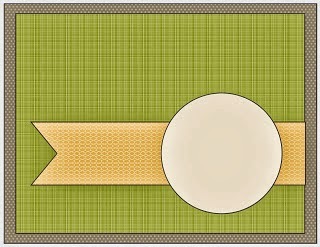 This is the sketch I created my card from. Wow, wasn't it nice to see the sun today! 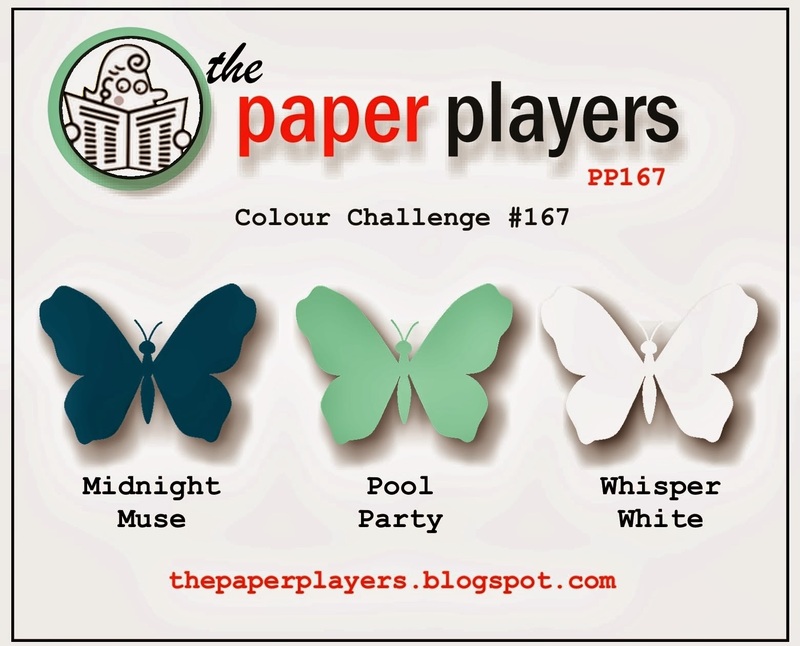 I am playing along with Paper Players color challenge. I love the colors they chose to use. They are so pretty and classy!!! I created a Christmas card which I loved creating. I really like how it turned out. Can you believe Christmas is just less than 11 weeks away? Time just flies when your having fun. Thanks again for stopping by and checking out my creation. Please feel free to leave a comment, I love reading what you think about my cards. Whew, I was determined to make this card for this challenge. I was gathering all my paper and inks and I could not believe I did not have the So Saffron Paper!!!! I made it work though! Nothing was going to stop me! If you want to join this challenge, go over to Pals Paper Art, there is still time. I hope everyone has a wonderful weekend. I hope that Congress will get themselves together and get all the Federal Workers back to work! Last night there was no talk about getting us back to work, but there was lots of talk about the Redskins and Dallas game. I see what is important to some people. Thanks for stopping by, please leave a comment if you like my creation. If you like my blog, please follow me. I'll be back. It's been a rainy gloomy day, so I have been in my craft room creating a little and catching up on my TV shows. What are you up to today? I am back participating in the colourQ challenge #210. Love the colors they chose for this challenge. Thanks again for stopping by, if you enjoy my cards, please click the button on the right to follow me. I also love to read your comments if you choose to leave one. Have a wonderful week and please come back! I am back! I hope you all are staying dry. Hopefully the rain has ended tonight. I have not been at work for two weeks, not because I don't want to be there. It seems like Congress cannot get their act together to get all us Federal Workers back to work. Enough of this. I have a card to share with you today. I am joining in on the Mojo Monday this week. I love Verve stamps, although I did not use one on this card. If you want to play along, you have almost a day to participate. Here is the link if you are interested. This week there is a giveaway for every 50 entries, hop on over to the Mojo and upload your card! I hope you enjoy looking at my card. I just got this paper by Fancy Pants and was excited to use it. I needed a male card and thought this was just the right paper. Thanks for stopping by, if you enjoy viewing my cards and blog, please follow me!